Nephrologists play an important role in providing medical education in a variety of settings, including the medical school classroom, nephrology consult service, outpatient clinic, and dialysis unit. Therefore, nephrologists interact with a variety of learners. In this article the current state of published literature in medical education in nephrology is reviewed. Eight attending roles are identified of the nephrologist as a medical educator in the academic settings: inpatient internal medicine service, nephrology inpatient consult service, inpatient ESRD service, outpatient nephrology clinic, kidney transplantation, dialysis unit, classroom teacher, and research mentor. Defining each of these distinct settings could help to promote positive faculty development and encourage more rigorous education scholarship in nephrology. Many nephrologists supervise, instruct, and inspire physician trainees across the medical education spectrum. From the classroom in medical school to the nephrology consult service, nephrologists have major roles in teaching medical students, residents, and fellows in training. In these various roles, nephrologists are often recognized as excellent teachers and mentors (1). Despite these laudable qualities, research in nephrology education is lacking (2). Although education research in nephrology has gained some ground in the last 5 years, the publication of high-quality studies in this area remains suboptimal. In fact, most published studies report survey results of learners and faculty perceptions, providing low levels of evidence to guide educational innovation and improvement (2). An understanding of educational research methodology is important for clinicians and nephrologists involved in undergraduate, graduate, and postgraduate medical education. The field of medical education has progressed significantly in the last two decades; however, medical education research in nephrology has been slow to adapt to changes (2). To examine some of these concerns, we define the various teaching roles of nephrologists in the academic settings to provide a foundation for exploring future research avenues. The current literature of medical education in nephrology is reviewed to establish where research deficits exist in each of the eight roles for the nephrologist educator. Examples from other academic specialties and subspecialties that have performed rigorous medical education research are also reported. We then explore the rigor and steps required to help move the field of nephrology forward in the arena of educational scholarship. The challenges and opportunities that nephrologist educators face when teaching medical students, medical residents, and nephrology fellows are considered. Finally, we propose that nephrology should embrace a bona fide career track for clinician educators in both the academic institution and professional societies. A MEDLINE search of indexed articles in nephrology medical education was performed with the help of a medical librarian. The search term “nephrology” and subheading “education”, further limited to citations in “English”, “human”, and “full text”, were used. A search with the subheading “fellowship education” and subheading “residency education” was also used. Editorials/letters, commentaries/perspectives, studies related to education of the public or patients, news postings, society addresses, and conference proceedings, continuing medical education/biomedical advances, and studies related to nurse education/practice were excluded. Abstracts from scientific meetings were not searched because a prior publication reviewing all accepted educational research abstracts from the 2008 to 2013 ASN Kidney Week meetings has already been reported (2). A MEDLINE search of indexed articles to collect a sample of education publications from other fields of medicine was also conducted. Specifically, randomized controlled trials done in medical education research during residency training in other fields of medicine were reviewed. A search with the heading “randomized controlled trials” and subheading “residency training” and subheading “education research” was also used. Selected publications from various fields other than nephrology with rigorous designs were selected to discuss as examples. The outcomes of the studies were categorized under knowledge acquisition, behavior change, or patient care outcomes. To identify key educator roles of nephrologists in the academic settings, we (K.D.J. and M.A.P.) described typical teaching activities as academic nephrologists. We probed the meaning of these different roles until agreement was reached on their distinctions. Eight roles were defined. To determine if these descriptions could be generalized across academic settings, an Internet survey (using www.surveymonkey.com) was developed and distributed to a group of randomly selected nephrology fellowship training program directors (TPDs) working in different regions of the country and across university and community settings. The survey included a short paragraph for each role that delineated the nephrologist’s teaching role, location of the activity, typical patients, learners involved, and teaching and evaluation methods used. For each role, survey respondents were asked if this role existed in their settings and if the description was accurate, inviting open-ended comments that were then used to revise the role description. Respondents were also invited to describe additional roles. North Shore and Long Island Jewish Health System’s Feinstein Research Institute granted institutional review board exemption for the survey. Responses to the survey were reviewed, and descriptive statistics (percent responses and acceptance of the descriptions) were performed. Modifications to role descriptions were made on the basis of suggestions of all respondents to each category. Results of the literature search are shown in Table 1. Seventy-three citations were retrieved for the initial nephrology education research search; most were unrelated to teaching and learning in nephrology. We were left with 30 (41%) articles after applying the exclusion and inclusion criteria. Six articles were related to student learning (3–8), five were related to postgraduate trainees (9–13), and 19 were related to fellows or fellowship training (1,14–31). None of the articles had teachers or faculty members as subjects of the educational investigation. Figure 1 categorizes each of these articles into their respective study design type. In addition, we performed a MEDLINE search of indexed articles from other fields (173 articles) to collect a sample of medical education publications using randomized trials from other fields to provide examples of interventions currently being performed in medical education (Table 2). 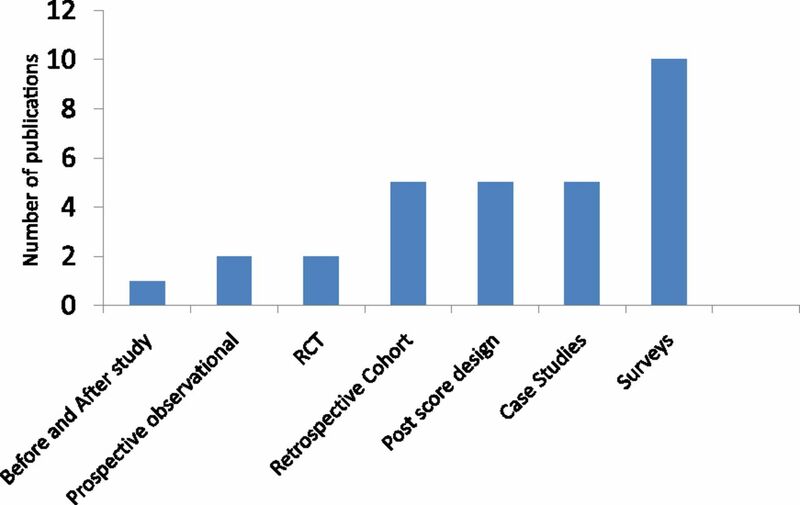 Number of nephrology medical education publications reviewed (N=30) categorized by research method type. RCT, randomized controlled trials. Selected medical education research studies in other fields of medicine. To define the various teaching roles that nephrologists perform, we surveyed TPDs from several institutions to describe the teaching roles at their center. Twelve TPDs responded to our survey (75% of those invited). The TPDs reported that seven of the eight predefined teaching roles existed at their respective institution, and approximately 60% of the TPDs felt the eight teaching role descriptions were accurate (Table 3). On the basis of survey responses, changes to the teaching descriptions were made to internal medicine attending role, medical school classroom teacher, and research mentor categories. Medical school classroom teacher was renamed classroom teaching to encompass resident and fellow teaching in the classroom setting. Patient-centered quality improvement project mentoring was added to the research mentor section. Of all of the eight teaching role descriptions, the only role that did not exist throughout each of the sampled centers was nephrologists as the internal medicine attending. However, because this role was present in 68% of the TPDs surveyed, we included it as a final educator role. On the basis of differences in structure in some centers, description of the internal medicine attending was altered to include nephrologists to be either service attending of record or teaching attending only. Overall, the rest of the survey results were in agreement with the eight roles of nephrologists as educators. The eight roles are as follows: (1) inpatient medicine attending, (2) renal inpatient consult attending, (3) inpatient ESRD service attending, (4) outpatient nephrology clinic attending, (5) transplant attending, (6) outpatient ESRD unit attending, (7) classroom teacher (medical student/resident/fellow didactic teacher), and (8) research mentor. The nephrologist-as-educator role descriptions are shown in Table 3. In addition, Table 4 highlights the similarities and differences within the different roles of the nephrology educator. Medical education in nephrology appears to lag behind the research and innovations occurring in other specialties. There are few rigorous studies on nephrology education published and little information on the role of clinician educators in nephrology. The important areas are subsequently discussed. Our literature review reveals that little guidance exists for addressing the teaching roles of nephrologists or faculty development that supports nephrology educators. Most reported single-site descriptive studies about curricular innovations. None discussed how nephrology educators might gain a deeper understanding of or how to improve their teaching, clinical supervision, or mentorship. Additionally, to compare and illustrate, we reviewed literature in other fields of medicine to illustrate examples of medical education scholarship (32–49) (Table 2). Research in medical education, just as in clinical research, is a highly structured process that involves careful protocols with a clear hypothesis, defined subjects, and careful data analysis. Importantly, we must improve our reporting and dissemination of high-quality medical education research. These data suggest that research in medical education in nephrology is lagging behind other specialties in medicine. In fact, we could only find a few studies that meet the rigor of bona fide medical education research (11,12,29). Only two articles met the randomized controlled trial design (11,12). In contrast, we found high-quality medical education research studies reported in both general internal medicine and surgery (Table 2). The articles in other fields can serve as a template for nephrology educators interested in pursuing high-quality educational research with rigorous methods that can be used to model their own research studies. The conceptual framework most widely used in medical education research is the Kirkpatrick classification that categorizes the outcome to either perception or knowledge of the trainee to change in patient outcomes (42). This framework suggests educational research that ultimately improves patient care has the biggest effect (Table 5) (50). However, most articles reported in nephrology educational research as described in Table 2 relate to outcomes of the participants rather than downstream patient care outcomes. We suggest that more research studies in medical education in nephrology need to be pursued that are level 4a or 4b that directly affect patient outcomes. Although levels 1–3 are important to consider in nephrology, randomized trials aiming for a level 4 type of outcome are desired. An example of a well designed randomized controlled trial in medical education with patient care outcomes that is currently ongoing is individualized comparative effectiveness of models optimizing patient safety and resident education. Nephrology educators should strive for study designs and outcomes that are similar in their research projects (51). Rigor is needed to conduct high-quality medical education research. As a guide to the nephrology educator interested in conducting research in medical education, we have summarized the various types of research in education in Table 6. Furthermore, Table 7 proposes a stepwise approach on developing a scholarly project in medical education. Once the type of study is identified, it must be refined to create a conceptual framework followed by review of the literature to find existing gaps in understanding. Understanding and identifying appropriate study designs and methods will substantially improve the quality of scholarly projects. Selecting outcomes a priori becomes one of the most important components in designing a study. Applying this systematic approach to study design will help to improve the rigor of medical education research in nephrology (52). Where does one begin when conducting research in medical education in nephrology? The various roles nephrologists play as educators are first defined to better guide us in potential avenues to conduct educational research. Once these roles are better defined, different educational interventions can be undertaken to improve the outcomes of education and ultimately positively affect patient care. To address this gap, we identified eight roles for the nephrologist educator. A selected group of TPDs confirmed these descriptions as accurately representing the nephrologists’ educator roles in most academic health centers in the United States. One limitation of our approach is the potential for sampling bias given the small sample size (12/140) of our survey. However, our goal was simply to attempt to validate and make changes of our descriptions of nephrology education roles. The roles described in Table 3 shed some light on various venues where nephrologists do interact with trainees across the medical education spectrum. Several unifying themes emerged among the different educator roles. The responsibility of the nephrologist educator includes assuring excellent patient-centered care, supervising learners’ care of patients, making judgments about what learners can be trusted to do with less supervision (53,54), assessing a learners’ performance, and providing constructive feedback. A comparison of the various nephrology teaching roles illustrated in Table 4 demonstrates the wide variety of learners that a nephrologist educator interacts with. These could include medical students, physician assistant students, interns, residents, or fellows. In the ESRD outpatient unit, the learners are usually fellows, but in some centers, medical students and residents might rotate on this service (12). Comparison of the nephrology teaching roles (Table 3) also highlights the opportunity for nephrologist educators to take the lead in developing interprofessional clinical learning experiences. With increasing emphasis on teamwork and collaborative practice noted in training program requirements (54), these venues could serve as ideal environments for learners from multiple professions to work together and learn about each other’s roles and responsibilities. These interactions could help to improve communication and collaboration among disparate professions, ultimately leading to new ways at looking at old problems. This could be especially beneficial when treating patients with complex health care needs such as CKD. For example, patients nearing the need for RRT involve collaborative practice among physicians, nurses, social workers, nutritionists, pharmacists, nurse practitioners, and physician assistants (ESRD units and transplant settings). All of these are potential topics for medical education research. Additional training in education research design and implementation is increasingly becoming mandatory for successfully navigating a career in medical education research (55). Courses have been designed to help provide an overview of a wide range of topics in education. Most courses should cover the following five domains: (1) principles and theories of education, (2) teaching methods, (3) educational research methods, (4) assessment and evaluation, and (5) educational leadership. The medical education research certificate from the Association of American Medical Colleges (56) is an excellent short course that is intended to provide the knowledge necessary to understand the purposes and processes of medical education research, to understand necessary literature, and to be effective collaborators in medical education research in nephrology. However, the medical education research certificate alone is not sufficient to produce independent medical education researchers. A master’s or doctorate degree in medical education is recommended to those planning on devoting a significant portion of their effort to medical education research. The Foundation of Advancement of International Medical Education and Research (57) website offers a listing of programs around the world. Additionally, the Harvard Macy Institute (58) offers training in medical education research for various experience levels and is another great resource. Besides acquiring knowledge of education theory and methodology, the aforementioned courses allow creation of appropriate mentorship that fosters creativity and guidance in the initiation of novel projects. Several deficiencies in nephrology education research were identified: (1) few rigorous studies performed in nephrology education and (2) lack of information on the role of educators in various aspects of nephrology. Eight distinct educational roles for nephrologist educators that include the classroom setting, inpatient wards, outpatient clinics, and dialysis units were identified. Our goal is to clarify these educational roles to provide a foundation for educational research and scholarship. Enhancing research that is rigorous and thoughtful in nephrology education will lead to improved curriculum design, instructional strategies, workplace activities of learners, and competency assessment. All of these educational venues challenge nephrologist educators to balance the demands of providing quality clinical care to patients with educating fellows, residents, and students. The time is ripe for nephrologists to address educational challenges and opportunities with the same standards applied to advancing basic science and clinical research. We would like to thank the following training program directors in nephrology for helping us define the clinical roles of the nephrologists: Drs. Nancy Adams, Gregory Braden, Stan Nahman, Suzanne M. Norby, Alan S. Segal, and Charuhas Thakar. We also thank all other anonymous survey respondents. Thank you to Dr. Judith L. Bowen, Medical Education, Oregon Health and Science University, for her tremendous contribution to the initial version of this manuscript and to Dr. Matthew A. Sparks, Duke University and Durham VA Medical Centers, for critical review of the manuscript.